The Volkswagen Phaeton is a saloon that hit the road in 2002 and it is the same car that ended up having to borrow from my wife countless times. I did a google search on the Phaeton a few days ago and I couldn’t believe what I saw, carbuyer and autocar had both given the Volkswagen Phaeton 2 out of 5 stars, whilst WhatCar only gave it 1 out of 5! I think that this is a massive injustice, the Phaeton was an absolute pleasure to drive which made you feel like you were in your own living room, it was almost like riding in a limo, especially if you were a passenger and you could barely hear a peep from outside. Obviously these journalists are a little bit finicky though, as What Car readers have given the Phaeton 4 out of 5 and the owner rating on AutoTrader is at 4.6 out of 5. Obviously then, your average vehicle owners are a lot easier to please the critics, and I imagine that is the best way to be. Bearing in mind what I’ve just said about the Phaeton, I found it interesting that the C30 achieved a score of 3.5/5 and 4/5 respectively on AutoCar and CarBuyer, yet got a worse score than the Phaeton with the AutoTrader owner rating which for me demonstrates that how much you like a car is a pretty personal thing, and you definitely shouldn’t take any of the reviews that you find on the internet, or anywhere else for that matter, as gospel. Anyway back to the Volvo C30. It has some unique styling which makes it a blend between a hatchback and a family car, personally, I love the look of it. It still looks sharp and sporty without compromising space. It seems incredibly well built and the cabin is excellent, running costs are low, it has a great safety and what’s more, it is fun to driver. The C30 is definitely the full ticket. When it comes to ford people immediately start thinking about the Focus and the Fiesta, which is fair enough I guess as they are both great cars. But one Ford that gets very much overlooked in my opinion is the Ford Fusion. Now the Fusion isn’t exactly a looker, so please don’t get it mixed up with the American Ford Fusion which is essentially our Ford Mondeo. It is classed as a Mini MPV and it is essentially the Ford Fiesta with a heightened roof. Richard Hammond somewhat negatively described it as a ‘Ford Fiesta, in a hat’, but is that such a bad thing? The fiesta is a great car, and extra head room should only make things better. The Mazda 5 is another Multi Purpose Vehicle but this MPV can seat 7 people! If you have a large family you will know how annoying it can be to do simple days out and having to take out two cars for the sake of one person too many to fit in one car. On the other hand, if you have been behind the wheel of a seven seater you will know that they can be pretty sluggish and annoying to drive, but not the Mazda 5, it is actually really fun to drive. It is incredibly practical and features sliding rear doors which is an excellent touch. The Peugeot 107 an affordable city car that does its job perfectly. I’ve had a go in one myself and loved it, it was filled with personality and it doesn’t look half bad either. Whilst I’ve had a little go in one, my sister was leasing a Peugeot 107 for years and she absolutely swears by it and she has worked her way through a few cars so she had a lot to compare it too. From my own experience though I could tell it was fun to drive and very nippy around town, it is also very cheap to run, a lot cheaper than my BMW Z3 that’s for sure! 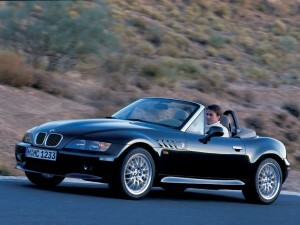 BMW Z3: Its a beauty, but it can be hard to justify.